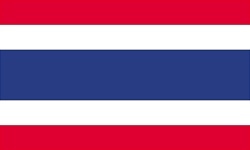 The flag of Thailand is made of five horizontal stripes. The center blue stripe is twice the size of the other four stripes. The top and bottom stripes are equal-sized red stripes. Below the top stripe and above the bottom stripe, there are white stripes the same width as the red stripes. The white stands for purity and is the color of Buddhism, which is the country’s main religion. The red stripes symbolize the blood that was shed to keep Thailand’s independence. The blue is Thailand’s national color and represents the Thai monarchy. Blue also honors Thailand’s World War 1 allies (France, Great Britain, Russia, and the United States who all fly red, white and blue in one way or the other from their respective flag poles). The current flag of Thailand was officially adopted on in 1917, which makes it somewhat of an historical flag. From the mid 1800s to '16, Thailand, then Siam, used a red-based flag with a white elephant centered on it. That red-based flag was replaced in '16 with a transitioning red and white horizontal striped flag which was modified a year later in '17 when they replaced the red center with blue. Some interesting facts about Thailand’s flag are that the Thai flag is called Triarong or Triaranga, which means “tricolor”. Even when Thailand changed its name from Siam to Thailand in 1939 when it allied with Japan in World War 2 its flag stayed the same.